Transform your backsplash on a budget—and declutter your entertainment center at the same time! See how a stack of unused CDs upgraded this boring, builder-grade kitchen. Remember when your biggest problem was keeping your favorite CD from skipping? Times were simpler before iPhones, Netflix, and high-speed Internet conquered the world. Thanks to digital libraries, almost no one is worried about the state of their CD collection anymore. But other quandaries—like what to do with all those old CDs now that we’ve moved on—hang around for years. 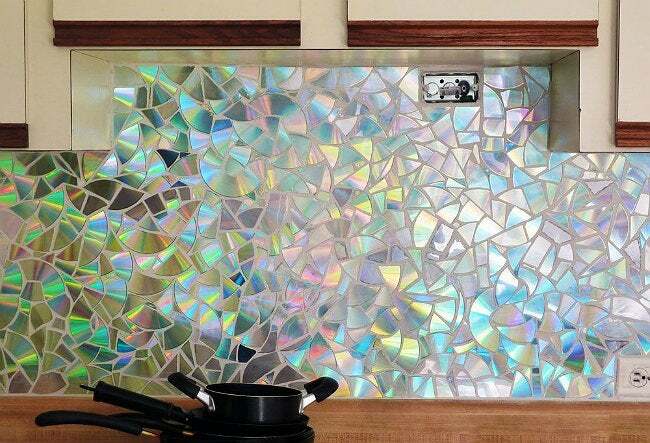 Instructables author Illona solved the dilemma of an unloved collection by crafting this one-of-a-kind kitchen backsplash using discs, scissors, grout, and very little planning. While relieving the environment of a little extra tech trash, her reflective backsplash brightened up the whole kitchen without the addition of a mirror or task lamps! Piecing it together requires very little as far as specific tools go—only a sharp, strong pair of scissors or one designed to cut plastic. To better preserve the holographic film that creates the mirror effect, first brush a layer white glue over the printed side of the CD and let it dry completely. Cut up your discs, then glue the larger pieces up first and fill in gaps with smaller cuts later. Once you’ve arranged all of the pieces, apply grout to your mosaic. Illona opted for a light grey over white grout to make cleaning easier; the color requires less scrubbing, preventing possible future scratches and preserving the rainbow effect of the holographic film. 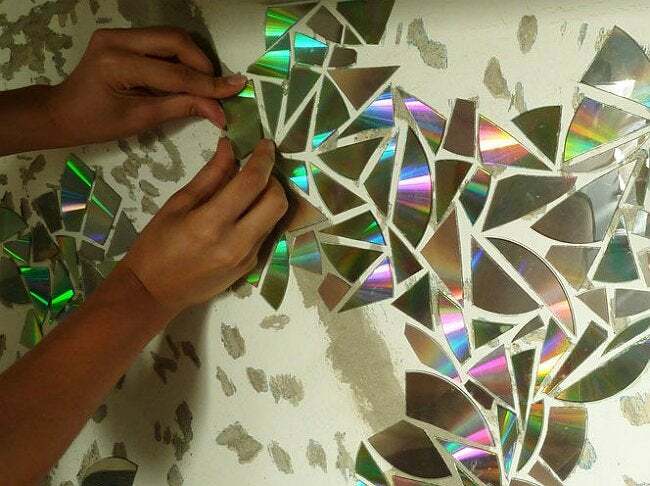 Even through Ilona ended up scratching some CDs in the trial-and-error process and dulling the project’s shine ever so slightly, any nicks are quickly lost against full effect of the mosaic. It’s practically impossible to mess up this DIY! With a backsplash this beautiful, it will feel like trading in your old flip phone for a smarter model.